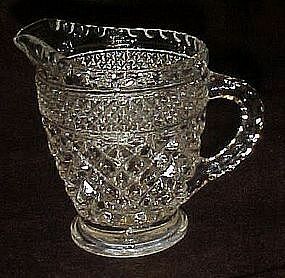 WEXFORD-Creamer Anchor Hocking-Pattern Beautiful Anchor Hocking clear glass creamer, Wexford pattern-4-1/4in.tall- Scalloped Edges. In Excellent Condition. It has a Raised Diamond Pattern Band around the top. The bottom Pattern is also Raised Diamond-1940's to 1960's.Excellent condition. See all the other Wexford pieces I have listed.